As the Cold War intensified in the late 1940s, security of the nation's Capital became a major concern of Defense Department planners. 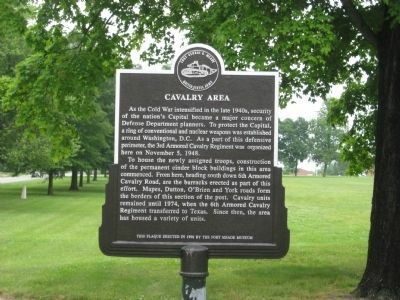 To protect the Capital, a ring of conventional and nuclear weapons was established around Washington, D.C. As part of this defensive perimeter, the 3rd Armored Cavalry Regiment was organized here on November 5, 1948. To house the newly assigned troops, construction of the perimeter cinder block buildings in this area commenced. From here, heading south down 6th Armored Cavalry Road, are the barracks erected as part of this effort. Mapes, Dutton, O'Brien and York roads form the borders of this section of the post. Cavalry units remained until 1974, when the 6th Armored Cavalry Regiment transferred to Texas. Since then, the area has housed a variety of units. This plaque erected in 1996 by the Fort Meade Museum. Erected 1996 by Fort Meade Museum. of 6th Armored Cavalry Road and Mapes Road, on the left when traveling south on 6th Armored Cavalry Road. Touch for map. 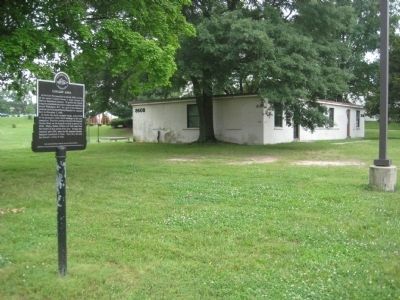 Marker is in this post office area: Fort George G Meade MD 20755, United States of America. Touch for directions. Other nearby markers. At least 8 other markers are within walking distance of this marker. "Cav. Area" (within shouting distance of this marker); Chapultepec Avenue (within shouting distance of this marker); World War I Cantonment Area (was approx. ¼ mile away but has been reported missing. ); Tipton Army Airfield (approx. 0.3 miles away); Dedicated to all American Ex-Prisoners of War (approx. half a mile away); The Battle of the Bulge (approx. half a mile away); 29th Infantry Division, United States Army (approx. 0.6 miles away); Maj. Gen. Ralph H. Van Deman (approx. 0.7 miles away). Touch for a list and map of all markers in Fort Meade. More. Search the internet for Cavalry Area. Credits. This page was last revised on June 16, 2016. This page originally submitted on June 4, 2009, by F. Robby of Baltimore, Maryland. This page has been viewed 1,140 times since then and 6 times this year. Photos: 1, 2. submitted on June 4, 2009, by F. Robby of Baltimore, Maryland.